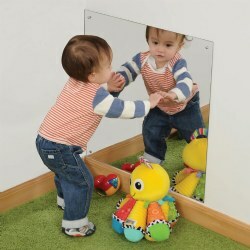 Help infants and toddlers develop basic social skills through mirrors and dolls. 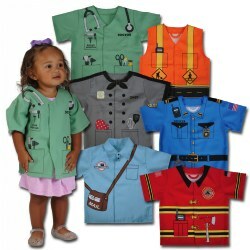 Kaplan also provides dress-up clothes and dramatic play props to engage children in imaginative play while teaching them important social skills. 2 years & up. Where's Bear combines 2 favorite activities-stacking blocks and finding hidden objects. 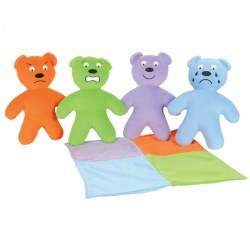 This games teaches children to take turns hiding and finding the bear under the sturdy nesting boxes. Monkey Around will get children up and moving with 40 cards that prompt players to do movements together. From hugs to high-fives, to simple skills like balancing, hopping, and marching. 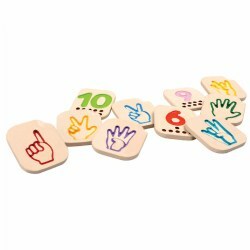 Included in the game is a bean bag banana that adds to the fun and learning. 2 years & up. 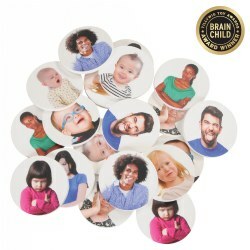 Help children strengthen their expressive and receptive language as they learn to talk about feelings and emotions with these easy-to-hold, double-sided mirrors. 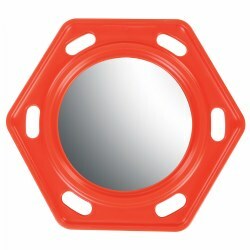 One side is a regular mirror and the other side is a "fun mirror" that warps reflections giving an amusing appearance. 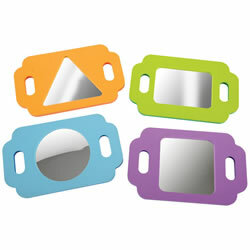 Each unbreakable, non-glass mirror measures 4"H x 6"L.
2 years & up. Line them up in a row or build them up and let them fall. 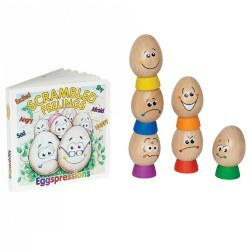 The set of six expressive wooden eggs also offers a role-playing activity to help children identify their feelings. Idea book is included. 12 months & up. 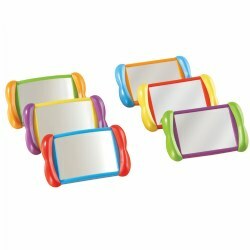 Colorful, cushioned acrylic mirrors have handles on each side for babies and toddlers to easily grasp as they smile at themselves and their friends. 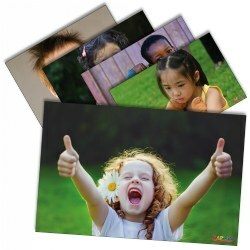 It's great to promote facial recognition and expressions. Made of unbreakable acrylic. Measures 13"L x 8"W. Set of 4. This photo display unit is at the child's eye level. 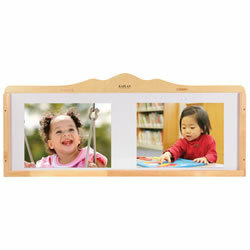 Just attach the hardwood frame to the wall, slip in pictures, art work or photos behind the plexiglass panel. 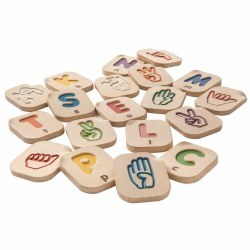 Great for language and cognitive skills. Mounting hardware not included. Measures 48"L x 16"H. Available individually or in a set of three. Stretch up, up, up... see who's in the mirror! Babies love to pull up and explore, developing self-awareness and motor skills. Wall-mountable shatterproof acrylic with lacquer-finished maple rail. Minor assembly required. (mounting hardware not included). Mirrors are 46"W x 12"L, the wooden bar is 47"W.
Birth & up. 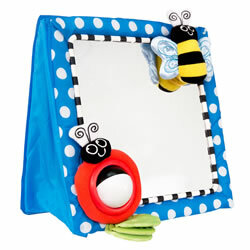 A large tru-reflection mirror with spinning balls, bold colors, and clicking bee engages baby's developing vision and curiosity. Easel back stands firmly on floor with soft frame construction. Measures 10" x 11". Explore little finger holes, teethe around the edges, or investigate reflections in the double-sided, unbreakable, non-glass mirror. 8" hexagon shape. 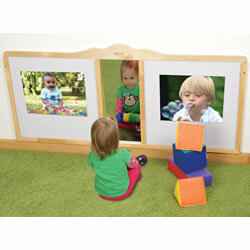 Children wonder all about the babies they see in this acrylic mirror! 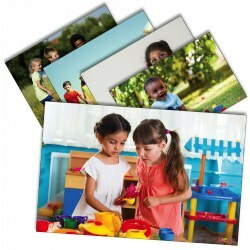 Adding pictures to the write-on/wipe-off plexiglass panels provides entertainment and visual stimulation. Maple construction with removable side panels. Mounting hardware not included. 60"L x 1 1/4"W x 27"H. Wt. 25 lbs. 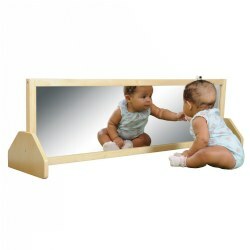 Reflections fascinate babies while developing their perception and self-awareness. 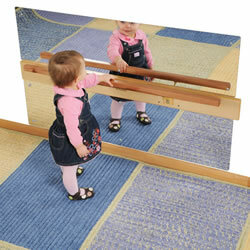 Mount one mirror or purchase two mirrors to create a reflective corner play space. Includes mounting hardware. Acrylic mirror measures 24" wide x 24" high. 18 months & up. 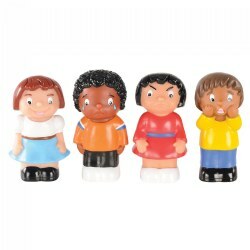 This set of four expressive dolls will allow children to role-play and identify feelings and expressions to build upon their social and emotional skills. 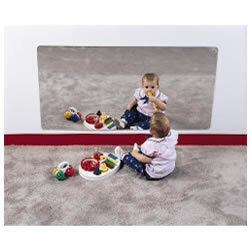 Reflections fascinate babies while developing their perception and self-awareness. This acrylic mirror is made just for them. Includes mounting hardware. This mirror is 48" wide and 24" high. 2 years & up. 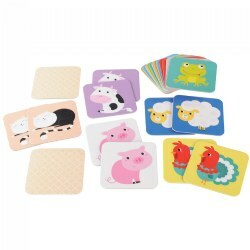 Encourage matching, memory, concentration, and cognitive thinking with these large 6" x 6" cards. 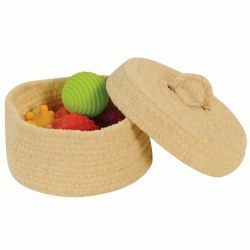 Start with 2 or 3 pairs and then add other animals as the child's skills progress. 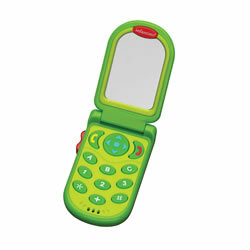 There are mirrors on the inside and outside of this triangular shaped product for a total of 5 mirrors. 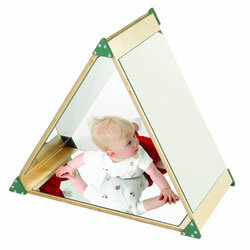 The effect creates a myriad of angles and viewpoints for walkers and crawlers to enjoy. 27"H x 31"W x 16"D. Some assembly required.